All Vikings fans hurry up, there is a surprise for you waiting. 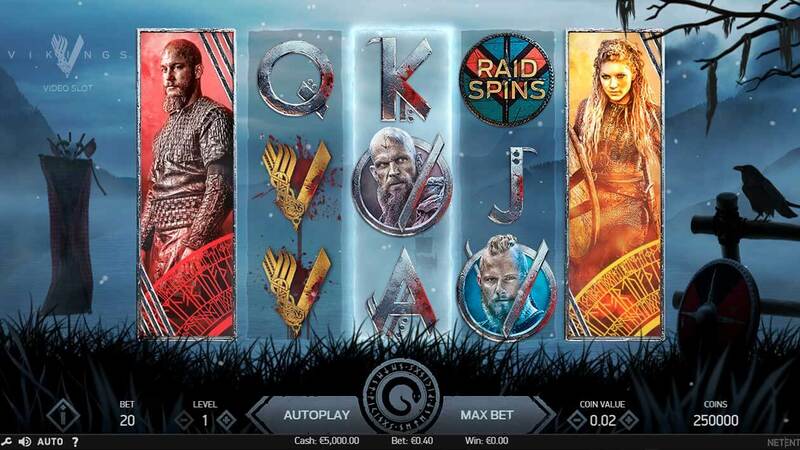 New NetEnt slot about Vikings. Read our review Vikings slot review and feel the power of Vikings! Finally, another branded slot by NetEnt is heading to all online casinos. It’s called Vikings. This time we will join a famous Scandinavian Norse clan and try to invade some European countries. 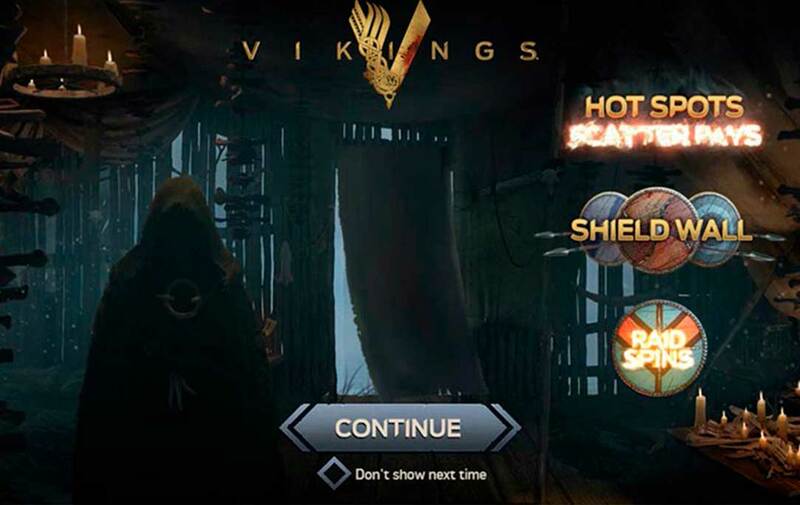 For those who don’t know Vikings slot is based on a popular tv show with the same title. First, it was premiered in 2013 and grabbed a lot of attention from the audience. Millions of fans enjoy brutal scenes from this show all over the world, so it was a good strategic decision for NetEnt to an officially licensed slot. Vikings is a 5-reel slot with 243 paylines in the base game and 78125 lines in the free spins mode. Minimum bet is as low as €0.20, and the maximum bet is enormous €200 per spin, which bigger than a typical €100. There are 10 pay symbols, 3 of them are high-value ones. The top paying symbol is Viking’s logotype, this symbol appears stacked on all reels and pay huge if you get it in the bonus game. The interesting thing about this slot is that there is no wild symbol, which makes seems that it’s hard to hit some lines. We must mention that graphics on this slot is amazing and we hope you enjoy it as much as we do. Don’t skip intro movie on this slot you will be surprised how good it is. Their many features you can trigger playing Vikings slot. Hotspot feature, Shield wall feature, amazing Rapid Spins symbol and raid spins with a total of three hotspots. Pay attention to the reel in the middle when you play Viking’s slots. It’s a special hotspot area, and it’s highlighted on every spin. If you catch a full stack of one of the main characters, you will trigger respins, where you need to catch as many same symbols as you can. In the base game you can catch 15 symbols maximum and win 2430x your bet, and if that’s not enough, you can catch up to 27 symbols in the free spins mode and land an amazing 10 000x win. Wowsers! If you are lucky enough you can trigger a random shield war feature on any spin. With its help you can land 6 or even 10 of the same kind of symbols. Scatter looks like a shield with raid spins text. You need to land at least three of them to start to get seven raid spins. Basically, it’s the same spins as in the base game with all features included but on a bigger 78,125 ways reels. You can’t retrigger those spins. How to win big on Vikings slot? Return to the player is 96,05% which is nothing special. This slot has a medium to high variance, which means, it should be hard to get a big win, but if you are lucky to hit some free spins quick, you might win huge. It’s possible to land a big win even if you didn’t land some free spins. But for a really huge win you need to get free spins and wait for shield feature to trigger and if you are lucky to land 27 top symbols, 10 000x win yours. Many of casinos we list will offer you a huge a welcome bonus to play with. And Viking’s slots is good opportunity for you to wager that bonus, as it pays frequently. If you are a big fan of Vikings TV series, this slot is a must play for you. Don’t like Scandinavian theme? Not a problem there is a reason for you to play this slot, as it has tones of features to trigger and a huge win potential, you don’t want to miss. It’s an html5 slot which means you can play it on any pc and mobile device.